BITCON2018.com - Boomer Technology Group, LLC.Boomer Technology Group, LLC. 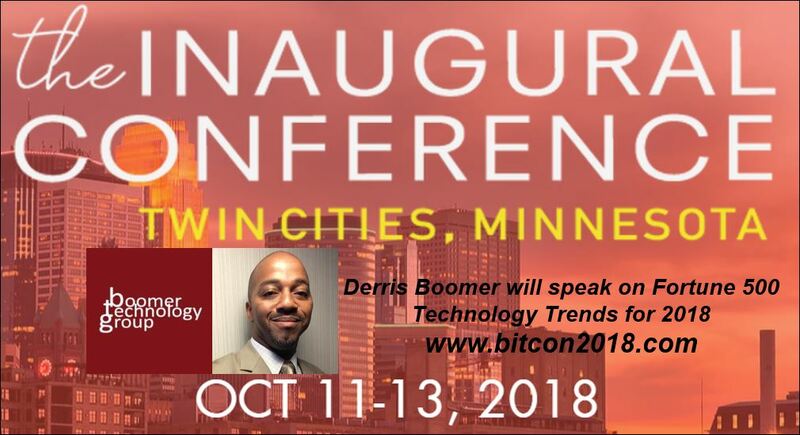 CEO of BoomerTechnnologyGroup will speak at BITCON 2018 on October 12, 2018. The conference will be held at the Twin Cities, Minnesota. 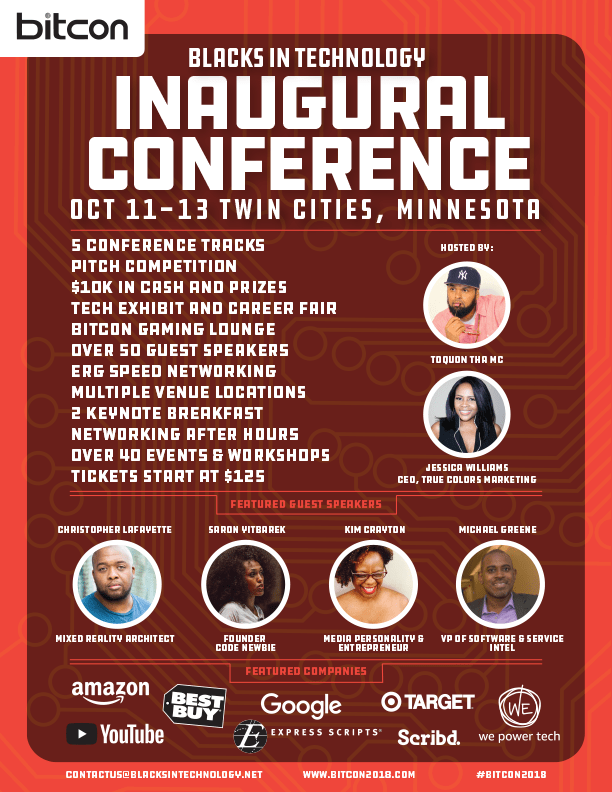 The three day event will be hosted by (BIT) Blacks In Technology. Mr. Boomer’s talk is entitled “Technology Trends for Fortune 500 Companies-7 THINGS YOU SHOULD KNOW!”. Learn about current Technology Trends for Fortune 500 companies such as Artificial Intelligence(AI), Internet of Things(IoT), Block Chain & Digital Currency, Cloud Enterprise Resource Planning(ERP), Software-as-a-Service(SAAS) and Big Data. Trends that will increase your salary by 25%-40%., Hottest Tech Trends to guide your career for next 10 years. Talk will review hot jobs that correlate to these trends. (BIT) Blacks In Technology is the largest community and media organization that focuses on black women and black men in the technology industry. Through community-focused activities, events and media, Blacks In Technology (BIT) is “Stomping the Divide” by establishing a blueprint of world-class technical excellence and innovation by providing resources, guidance and issuing a challenge to our members to surpass the high mark and establish new standards of global innovation. BITCON2018.com has curated an exceptional roster of subject matter experts, influencers, and corporate executives to be guest speakers at the 2018 conference! This entry was posted in Community TECH event and tagged BITCON2018.com. Bookmark the permalink.